Certification Information: EFT-CC, EFT-Advance, EFT Cert-1, EFT Intermediate Practitioner (EFTUniverse) AAMET levels 1, 2 and 3. AAMET stands for the Association of the Advancement of Meridian and Energy Therapies. I have regular consultation with Ann Adams, EFT Master. Have completed self study in Energy Psychology Interactive through Association of Comprehensive Energy Psychology, where I am also a member. AAMET Level 3 certifies that I am an experienced EFT Practitioner. I have over 1200 hours of practice with individuals, families, couples, children and all kinds of issues, concerns or problems, results are about 98%, and hold an LMSW in the State of Michigan. **Remember, EFT Practitioners are not legally certified, as there is no legal certifying body at this time; my certifications indicate that I have completed training and passed exams which certify that I can apply EFT as it was developed or taught. Emotional Freedom Techniques is a system of meridian stimulation or 'tapping' developed by Gary Craig to balance energy disruptions resulting in negative emotions associated with an experience. The EFT discovery statement: 'The cause of all negative emotions is a disruption in the body's energy system.' Once those energy systems are balanced, such as by tapping, while holding the negative experience in mind, the disruption is corrected. Once corrected, people report feeling better and have a difficult time feeling negative again when the particular experience is recalled. If you are looking for an EFT practitioner, you will find me to a skilled EFT Practitioner who is also familiar with other energy psychology techniques. You will find me knowledgeable in many subjects . You will find me to be intuitive. The best way to reach me is by using the phone number above. 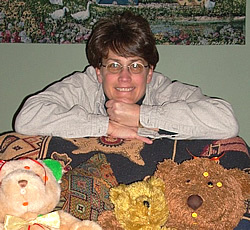 In this photo, I am shown with several tapping buddies I created with gently used stuffed animals and a variety of grommets; they help clients to remember the EFT Basic Recipe! And they are fun. I work with a new client a minimum of two hours addressing one major problem; a session might look like 'assess'/'treat'. I do not tap my client. The client and I face each other and follows me while I tap my own meridian system. There are two goals for each client: 1. learn the EFT tapping sequence as well as how to narrow the focus to specific aspects. Ann Adams offers: for results that are terrific, it's best to be specific. 2. relief from the problem. Clients are assessed at initial phone call for psychiatric history, their goal; I look for safety concerns and whether or not the client would be better served by another intervention. There is a set fee for the Initial 2 hour session. There is no sliding fee scale. There is no trade. Clients can make payments affordable to their resources. I use a contract/consent format which indicate potential risks, obtains Consent, identifies clients are taking responsibility for themselves, that the client has answered assessment questions truthfully, that there is on-call phone support, a written session summary to follow within two weeks and refund of half if a client does not achieve desired results. No refund for addictions, but don't worry, I can accurately assess readiness and determine a client might want to work on underlying problems first., thus saving client time and resources. Any subsequent sessions desired by a client are set by hourly fee. I call each client the following day to check well-being and outcomes. I appreciate having a way for people to feel better 'faster' while giving them the tools to help themselves independently. While one session may not be 100%, I guarantee clients feel better following an EFT session with me and they will have a direction and a technique to continue their work. My Service goal is that all customers are happy with the service provided, that they are warmly welcomed, are taken seriously and are carefully assisted to use Emotional Freedom Techniques independently and as effectively as possible. Why should you learn EFT? EFT is easily the simplest and fastest way for emotional relief. There are few, if any, meaningful physical side effects, such as may come from chemical medications. 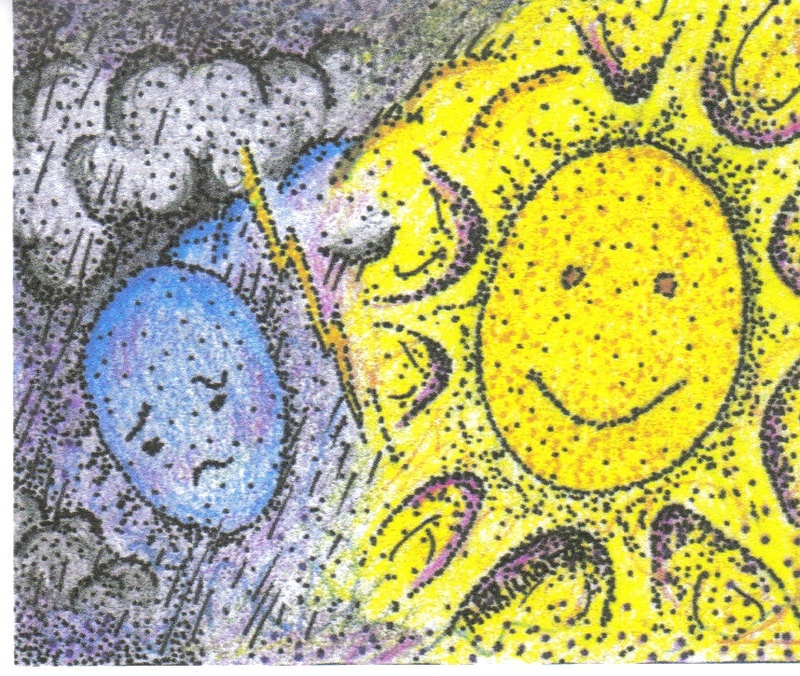 Once EFT is learned, it is easily recalled and applied for emotional relief. Why should you learn EFT from me? I offer affordable services, I am accessible and skilled in many areas of EFT. I have accumulated over 1000 practice hours with about 98% effectiveness. Why should you learn EFT now? How much is it costing you to keep the problem? When I learned EFT by addressing my nicotine addiction, my income immediately increased by $160.00 per month because I was no longer buying nicotine gum!!!! My $180.00 investment was a great pay off in other ways too in that after some weeks using The Personal Peace Procedure, I slept great at night, my mind was slower, was not worrying, developed effective belief systems - and these were just the 'happy accidents.